This is the 2008 event - Click here for 2011. Currently: Join the mailing list. Pre-registration has now closed. See twitter (left sidebar) on the day for details of unregistered ticket availability. Open Tech 2009 is an informal, low cost, one-day conference on slightly different approaches to technology, democracy and community. This year's theme is "Working on Stuff that Matters" guarantees a day of thoughtful talks and conversations with friends. Totaling 33 talks across 3 sessions covering 7 hours, some space hijacking and plenty of time to talk in the bar after sessions which challenge, inspire or talk about something that makes you want to help how you can. The last two times we have sold out in advance, so you are strongly advised to pre-register. What's the day going to have? Back for 2009, OpenTech promises a day of thoughtful talks and conversations with friends. One of the strands we'd like to see running through the day is "working on stuff that matters", whatever you work on. Find out more. 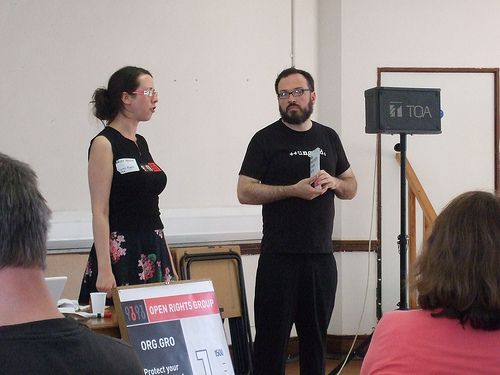 This event's predecessors, in 2008 and 2005 were low cost, one-day conferences about technologies that anyone can have a go at, from "Open Source"-style ways of working to repurposing everyday electronics hardware. Before that was NotCon 2004, an informal, low-cost, one-day conference on things that technologies were perhaps not intended to do.